Marian Goodman Gallery is very pleased to announce the first exhibition in our New York space of the work of Cristina Iglesias. On view will be new sculpture and installation works. The exhibition opens on Wednesday, September 7 th and will be on view through Saturday, October 1 st . Gallery hours are Monday through Saturday, 10 am to 6 pm. 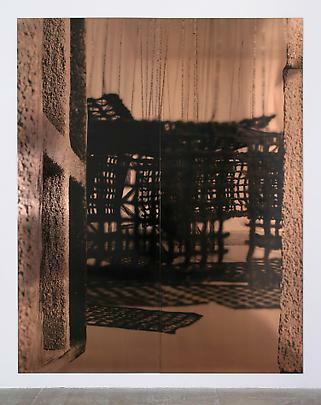 Cristina Iglesias is best known for changing the vocabulary of sculpture through her fabrication of entire zones or environments of experience and for her use of architectural and literary traditions which are utilized in relationship to a given site. 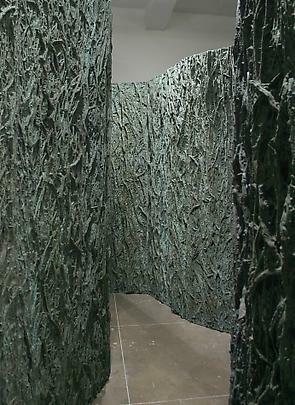 Using facades and screens, cast walls and constructions which often act as a 'skin', Iglesias' installations feature solid or filigreed perimeters which typically both obscure and reveal an inner space, creating rooms of imagination and representation in which words are seemingly uttered, but the mystery of them remains. 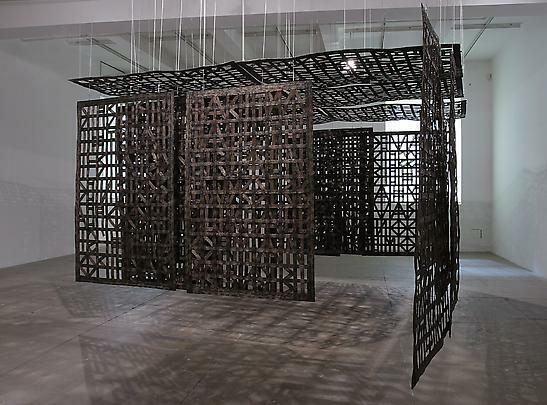 Like flying carpets tracing out a maze of passageways, her veiled surfaces bring to mind the intrigues of a fictional world in which what is accessible remains slightly concealed, as if behind the ornament of a Moorish structure or the lattice work of a Mughal jalli screen. For this exhibition, the artist has created two new large-scale installation works and a series of new silkscreen works on copper. 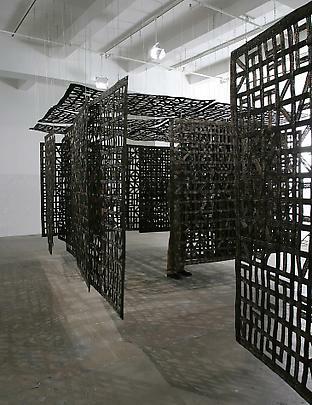 On view in the North Gallery, Untitled (2005) is a double pavilion of woven metallic screens suspended vertically and horizontally throughout the space like a floating nomadic tent, enveloping the viewer and transforming the space. 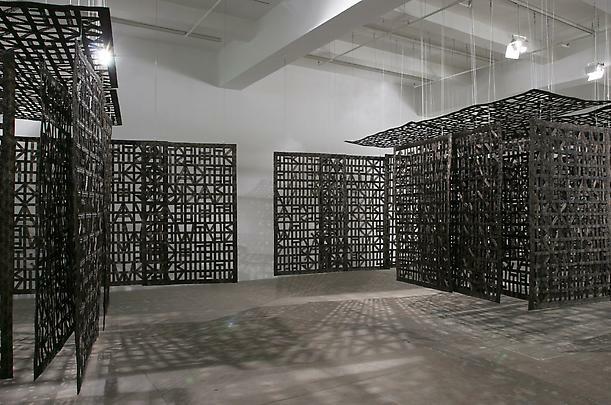 Light, illuminating the work from above, casts shadows onto the floor and walls, where the spectral presence of an undecipherable language provides an encounter with words hidden in diagonal patterns of symbol and image, darkness, and light. What first appears abstract becomes literal upon closer scrutiny, revealing an enigmatic motif of script drawn from the words of Arthur C. Clarke's science-fiction classic, Rendez-Vous with Rama (1973). 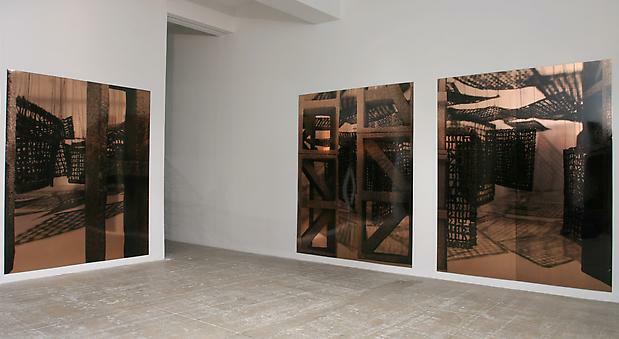 Integral to this landscape, a set of eight large-scale silkscreen copper diptychs, Untitled (Diptych XV-XXII), 2005 are installed in an adjacent gallery. 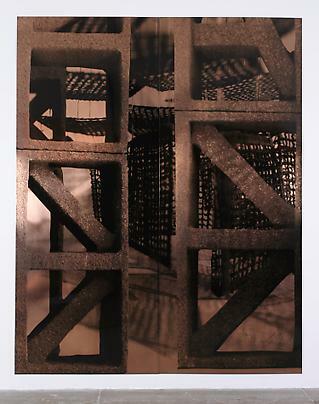 Created from sculpture, photo collage and drawing which are silkscreened onto copper panels, these works reinforce the complex fiction of reflective and interstitial spaces that Iglesias' work constructs, mirroring the suspended pavilions of the front room. 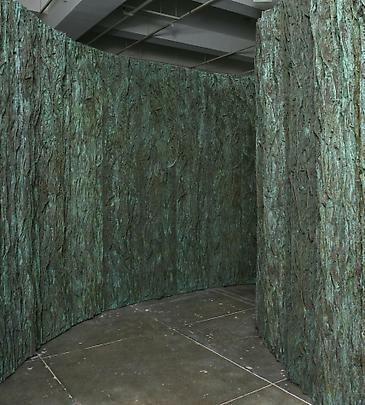 In the South Gallery, Untitled (Pasillo Vegetal III), 2005, is a curved chamber, a cul-de-sac , which completes the labyrinthian environment. 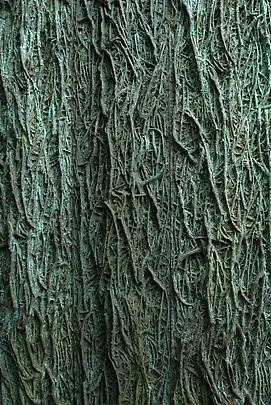 An innovative mass of organic, artificial and vegetative growth cast in resin and patinated bronze powder, the work further inspires an imaginary topos, an otherworldly sense of place. Part chimerical construction, part architectural arcadia, with its dense and tactile terrain endlessly proliferating and decaying, here one experiences the enclosed world and fabulist territory of Iglesias' invented nature. This past year Iglesias had the distinct honor of receiving a special commission to create the entranceway for the forthcoming addition to the Museo del Prado, Madrid. Related to the work that has been created for this exhibition in the South Gallery, the newly commissioned entrance will open to the public and be on view in June 2006. Upcoming projects in 2006 include a solo exhibition scheduled to open in March at the Ludwig Museum, Koln, as well as an invitation to participate in Site Sante Fe, New Mexico next July. Cristina Iglesias was born in San Sebastian in November 1956 and lives and works in Madrid. 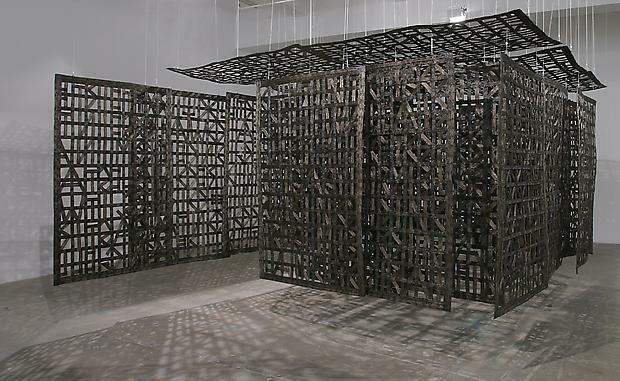 One person shows of her work have been held at numerous institutions around the world including, in the past decade, the Whitechapel Art Gallery, London and the Irish Museum of Modern Art, Dublin (2004); Museu Serralves, Fundacao Serralves, Oporto (2002); Carre d'art, Nimes (2000); Palacio de Velazques, Museo Nacional Centro de Arte Reina Sofia, Madrid, and the Guggenheim Museum, Bilbao (1998); the Renaissance Society, Chicago, and Solomon R. Guggenheim Museum, New York (1997); and the Stedelijk Van Abbemuseum, Eindhoven (1994). 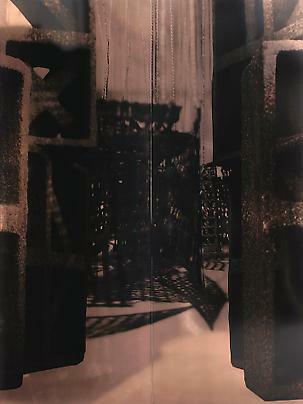 In 1993, Iglesias represented Spain in the Spanish Pavilion of the XLV Venice Biennale. 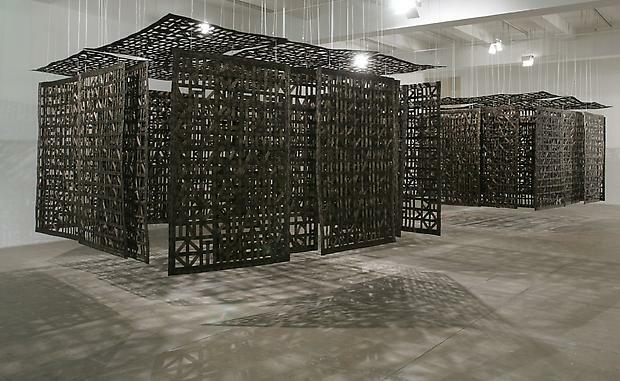 Iglesias' work can currently be seen in The Big Bang : Destruction and Creation in the Art of the XXth Century, a thematic group show of the collection of the Centre Pompidou, Paris, on view through February, 2006. Her work has been included in several group exhibitions, including La Ciudad que nunca existio , Centre de Cultura Contemporania de Barcelona, Barcelona and Museo de Bellas Artes, Bilbao; Happiness: A Survival Guide for Art and Life, The Mori Art Museum, Tokyo; Conversation: Recent acqusitions of the Van Abbemuseum , School of Fine Arts, Athens; Temper of Women, Ville de Luxembourg et Musee d'Histoire, Luxembourg (2002); Breeze of Air, Hortus Conclusus, Witte de With, Rotterdam, and Dialogue Ininterrompu , Musee des Beaux Arts, Nantes (2001); the Spanish Pavilion for the Exposicion Universal de Hannover, 2000, Hannover, Germany; the Carnegie International, Carnegie Museum of Art, Pittsburgh (2000); and The Eighth Biennale of Sydney, Sydney, Australia (1990). Please join us at the exhibition on Wednesday, September 7 th , from 6-8 pm.